Christina Romer talks to Northwestern students and faculty members Monday evening. Romer, who previously served as one of President Obama’s key economic advisors, gave a lecture on forecasting and measuring economic recessions. The former chair of President Barack Obama’s Council of Economic Advisers spoke Monday at the Donald P. Jacobs Center about the aftermath of economic crises and about possible solutions to prevent future problems. More than 100 people attended the talk by Christina Romer, an economics professor at the University of California, Berkeley. Romer served as this year’s speaker for the annual Susan Bies Lecture on Economics and Public Policy. 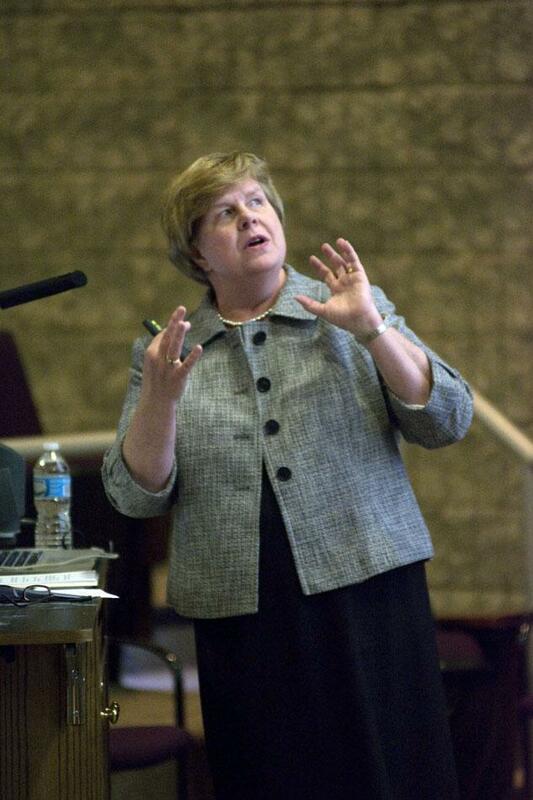 The lecture was first organized in 2008 and has been held every year since to honor Northwestern alumna Susan Schmidt Bies (Weinberg ’68, Kellogg ’72), who worked on the Board of Governors of the Federal Reserve System from 2001 to 2007. The series of talks alternates between covering macroeconomic and microeconomic topics while seeking to honor individuals who have made contributions to public policy. Romer’s talk, “The Aftermath of Financial Crises: It Doesn’t Have to be Terrible,” covered the reasons why she believes economic failure is detrimental. However, she noted the extent of the economic failure depends on the duration of the financial stress and whether or not a currency crisis coincides with this stress, among other factors. As the former chair of the Council of Economic Advisers, Romer served as a main spokesperson and one of four principals who met with Obama daily to devise a response to the Great Recession, the economic downturn which lasted from December 2007 to June 2009. She was influential in financial, healthcare, and budget reform following the economic crises. Through her experience as a policymaker, she focused on the ways policy can be used to prevent and remedy these types of crises. During the talk, Romer cited developing research focused on the impact of financial crises primarily on Western European countries. This project, which is still in its preliminary stages, is being conducted by Romer and her husband, both of whom are co-directors of the Monetary Economics Program at the National Bureau of Economic Research. James Myatt, an economics graduate student and teaching assistant, said although he primarily works within the field of microeconomics, he attended the event because of his extensive study of macroeconomics as an undergraduate student. He said he also enjoyed hearing Romer’s stories from working as a policymaker for Obama. “The takeaway for me was that she was calling for better regulation to prevent crises in the future, which is something that I’m more interested in,” Myatt said.